Many of today’s mechanical “gaming” keyboards are innocuous devices that are just at home in an office as they are a game room. Corsair’s K95 RGB Platinum is not one of those. It’s a brushed aluminium boat of a keyboard with dedicated macro keys, a silver volume wheel and extra RGB lighting, just in case. With my personal keyboards getting smaller and smaller each day, I was unprepared for Corsair’s K95 Platinum. Even my full-sized, 104-key boards are dwarfed by it, with its wide bezel to accommodate media and programming tools and the extra macro keys on the side. Weighing nearly three pounds, this is a keyboard that arrives on your desk with a heavy “thunk,” announcing its intentions to stay and play video games for a while. Want RGB lighting? The K95 Platinum allows users to program lighting for each individual key or multiple zones, with special effects layered on top. Not only do the keys light up, it’s got strip of programmable LED lighting along the top edge. This board is lousy with colored light. It’s not just the lighting that’s programmable, either. The six dedicated macro keys can be set to do just about anything a keyboard and mouse buttons can do, from launching a program to intricate strings of commands complete with timed delays. The K95 RGB Platinum comes in two colors, black and gunmetal. It also features a choice of two Cherry MX switch types—tactile brown or silver “speed” switches. If you plan on typing, go for browns. If your main plan is gaming and you want hair-trigger control, go for the silver. The version I am reviewing here is the black unit with the silver switches, because someone at Corsair obviously wanted to see me make all the typos. Dimensions: 18.3” x 6.7" x 1.4"
Like A G6, Like A G6: There are plenty of keyboards out there with macro creation capability, but the additional sloped and textured macro keys on the K95 make the act of executing a complicated series of actions with a single button press feel more profound. Over to the right? Those keys are for typing. The six on the right? They’re the killing keys. The previous version of the K95 from Corsair featured three rows of six macro keys, which made the board absolutely massive. Six is nice. I like six. Get Lit: If you’re going to go RGB, you might as well go all the way. It’s not just shining through every key on the K95. It’s also shining through the logo and the strip along the top edge. And that strip is made up of 19 different LED segments, so it’ll play nicely with all the special effects. The software for this thing is really great. I don’t think I’ve had more fun playing with keyboard lights. Right On CUE: The Corsair Utility Engine is a user-friendly application that handles programming the K95's lighting and macros. It’s easy-to-grasp and features a nice bit of depth if you really want to get your $200 worth of custom commands and pretty lights. Keep Rolling: It’s a small, stupid little addition, but I love that damn volume roller in the top right corner of the board. When I unboxed the K95 I was certain I would never use the shiny silver cylinder. Now I lean forward and gently raise of lower my speaker volume with the authority of a pretend record producer. Reversible Rubber Dust Magnet: The K95 comes with a detachable wrist rest with a reversible magnetic rubber cover. One side is textured, the other is smooth. Both sides collect every speck of dust in your computer room and cling to them as if they needed dust to survive. The rubber also grips the skin slightly, which isn’t a great feeling. The Caps Aren’t Great: Between the odd wide font and the thin ABS plastic, the keycaps that come on the K95 RGB Platinum aren’t great. I love the textured space bar of macro keys, and the board does include a packet of similar replacement keys for the WASD and QWER keys, which is nice, but this board is screaming for thicker, sturdier double shot keycaps. Thick And Meaty Cable: As with most boards with a USB pass-through port, the K95's braided USB cable is as wide as a fountain pen and ends in a pair of USB plugs—one for the keyboard, one for whatever is plugged into the spare USB port on back. I know it can’t be helped. I still hate it. Swapping out keycaps on the K95 Platinum can be a little tricky, thanks to Corsair’s non-standard bottom row. An off-the-shelf set won’t have the oversized left control key, the smaller Windows and function keys or the 6.5 key-width space bar. For a full matched set, you’ll have to go for something pricier. Or go for a cheaper set, and buy the extra keys ala carte from a store like Max Keyboard. What about the six extra keys on the left side? That’s where the artisan keycaps go. Artisan keycaps are hand-made in small batches from various artists and sold for much more than anyone in their right mind would pay for a small piece of plastic, glass or metal. In my experience, people who get heavy into collecting artisans are frightening. Maybe just keep the G-keys. The K95 RGB Platinum is a keyboard that knows its audience. It’s not trying to double as a workaday keyboard. It’s not trimming the edges off in order to create a profile more appealing to the mechanical keyboard community at large. 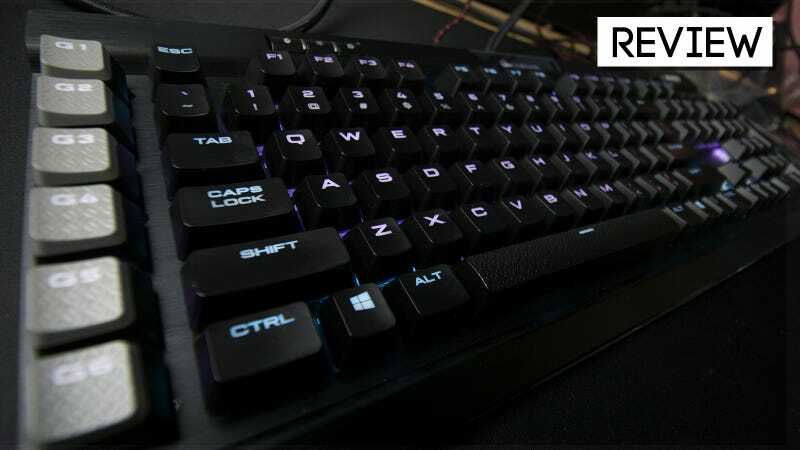 The K95 RGB Platinum is proud of its gaming pedigree, even if its features, limited switch selection and relatively high $200 price tag might make all but the most gaming-focused mechanical keyboard hunter look elsewhere. I can respect that.